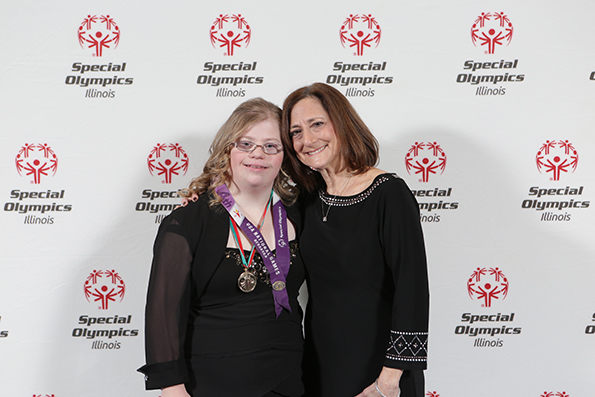 Dr. Sandra S. Block, a major presence at Special Olympics Illinois’ Opening Eyes events, recently received one of the American Academy of Optometry’s highest honors – the Carel C. Koch Memorial Medal Award. The award is presented to a person who has made outstanding contributions to the enhancement and development of relationships between optometry and other professions. Dr. Block is a faculty member at the Illinois College of Optometry – serving as a professor and Medical Director of school-based Vision Clinics for the Chicago Public Schools. She is a Global Clinical Advisor to the Special Olympics Lions Clubs International Opening Eyes program. She has been involved in every Special Olympics Summer and Winter World Games – a total of 10 – since the 1995 Games at Yale University. She has been involved in planning the Healthy Athletes Opening Eyes activities for the 2015 World Games in Los Angeles. The overall purpose of the Special Olympics Healthy Athletes program is to educate families about prevention and the importance of health care as well as educating health care providers about how to treat people with disabilities, with the hope that they would open their doors and provide service to people with intellectual disabilities. She wants to share her passion about the importance of eye care for persons with intellectual disability and other disabilities, engage more health care providers to provide high quality health care, and to educate athletes and their families about the need for them to seek eye care service for both prevention and treatment of eye problems. Dr. Block has worked with health professionals from the other Special Olympics Healthy Athletes disciplines including Special Smiles, Healthy Hearing, Fit Feet, FUNfitness, Health Education and in planning MedFest events around the world. At Illinois Opening Eyes events, Dr. Block assists the Illinois Directors Dr. Christine Allison and Dr. Melissa Sigler.